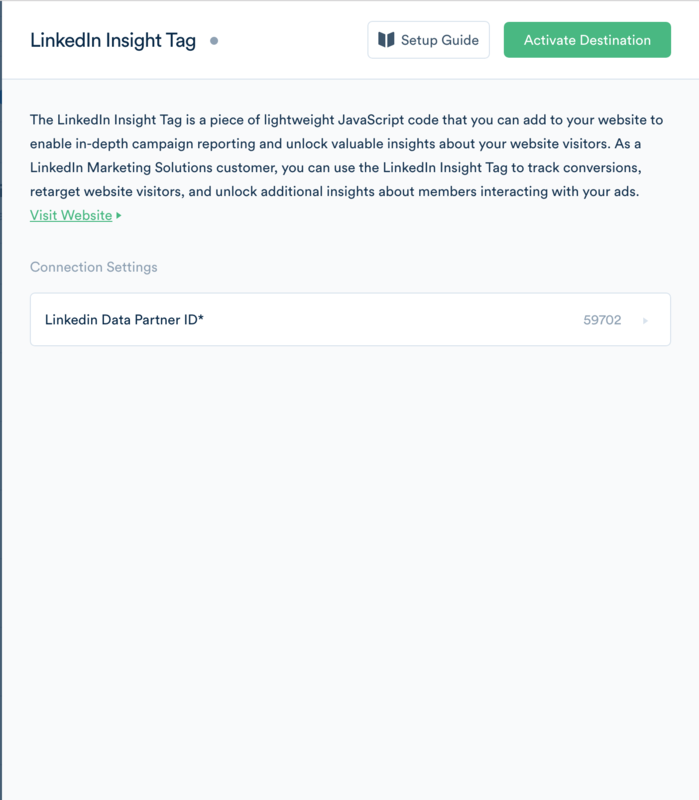 Segment makes it easy to send your data to LinkedIn Insight Tag (and lots of other destinations). 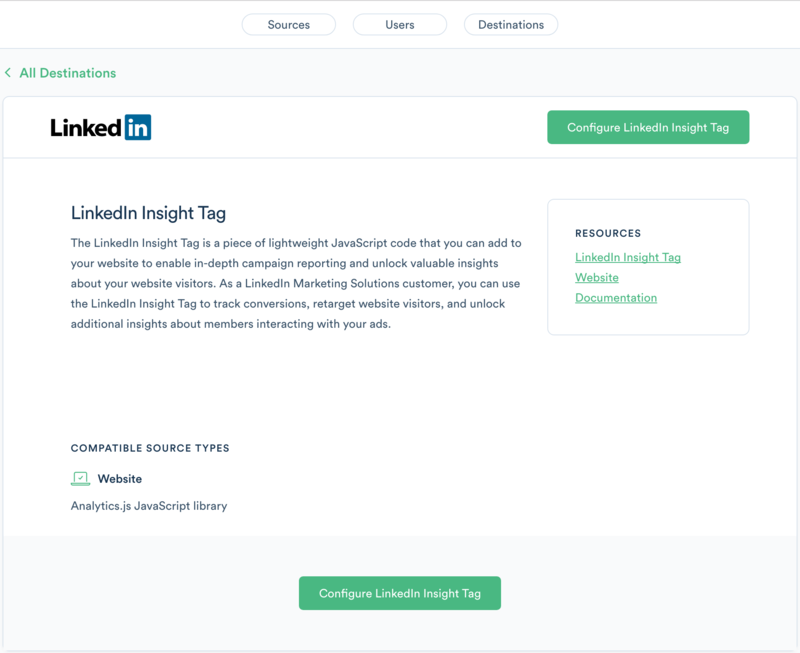 Once you've tracked your data through our open source libraries we'll translate and route your data to LinkedIn Insight Tag in the format they understand. 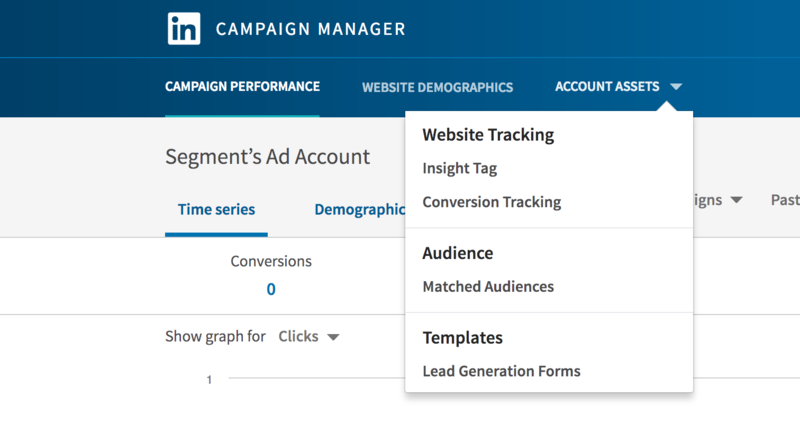 Learn more about how to use LinkedIn Insight Tag with Segment. Our CDN is updated within 5-10 minutes. Then our snippet will start asynchronously loading LinkedIn Insight Tag’s tracking snippet onto your page. This means you should remove LinkedIn Insight Tag’s snippet from your page. The LinkedIn Insight Tag will automatically start loading the pixel on sites which you load Analytics.js on. The LinkedIn Insight Tag Destination doesn’t utilize any Segment API calls (e.g. Identify, Track, etc) - just load it, and it’s good to go! Here’s how to get started with the LinkedIn Insight Tag! 1. Log into the LinkedIn Campaign Manager. First, head to the LinkedIn Marketing Solutions page. From the “Advertising” dropdown menu, we’ll want to select “Sign in to Campaign Manager.” If you don’t have a LinkedIn business account, then sign up for one now. Once that’s complete, head into the Campaign Manager! 2. Create an Ad Account. Next, create an Ad Account in order to access the LinkedIn Insight Tag. It will ask for some currency information, but no payment is currently required to access the Insight Tag. Once the Ad Account is created, it’s time to find the tag. 3. Get the LinkedIn Data Parter ID. Inside of the Campaign Manager for the given Ad Account, open the “Account Assets” dropdown Menu. From there, select “Insight Tag” and move on to the specific tag! In the code that makes up the tag, find the variable named “_linkedin_data_partner_id” and get the number from that. In our case, it would be 59702 - however, make sure to use the number given directly inside of the tag! Once that number is found, we can move to the final step. 4. Activate the LinkedIn Insight Tag destination in Segment. Log into your Segment account, and go to the Destinations Catalog in the desired workspace and select the LinkedIn Insight Tag destination (located at https://segment.com/<Your Workspace>/destinations/catalog/linkedin-insight-tag). From there, select “Configure LinkedIn Insight Tag” and select the desired source to activate it for, and select “Confirm Source.” The selected source will be loaded, and a sidebar will appear, asking for the LinkedIn Data Partner ID. Select that option and put in the LinkedIn Data Partner ID that we collected earlier. Select “Save” then select “Activate Destination.” Our servers will build the latest CDN for that source, and the LinkedIn Insight Tag will then load on the sites that use that source’s Segment snippet! Enter your Linkedin Data Partner ID. It should be a series of numbers, like 12345.